Wellington Place homes in north Las Vegas, Nevada real estate by Richmond American have exterior features including wrought iron detailing and stone exteriors detailing. The floor plans for Wellington Place come from Richmond American’s Stonegate Collection. These homes range from 1,850 to 2,400 square feet, three to five bedrooms, 2 1/2 baths and a two car garage. The new homes in Wellington Place real estate have open layouts and great character with the outside stylizing. The Cliffstone floor plan is 1,850 square feet, three bedrooms and 2 1/2 baths. A kitchen and nook, formal dining room and a great room is located on the first floor with a price from the $290,000s. The two secondary bedrooms, master bedroom suite, tech center and laundry room are located upstairs. 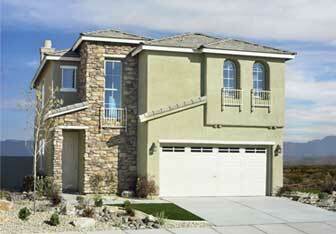 The Pebble Stone new home floor plan in Las Vegas, has 2,150 square feet, four bedrooms and 2 1/2 baths. The kitchen and nook is open to the family room. The Ledgestone floor plan is 2,200 square feet, with four bedrooms, 2 1/2 baths with an option of a loft. The bedroom on the main floor can be an optional formal living room. This home is priced at $310,000s. The largest floor plan is Cobblebrick with five bedrooms, and a main floor bedroom and bath. The second floor has a tech center with options available and the north Las Vegas homes are priced from the $330,000s. Richmond American is building homes in 50 communities throughout the Las Vegas Valley. Wellington Place Las Vegas homes by Richmond American showcase design elements.